Anchorage, Alaska - Bill Allen, the former head of VECO, an oil field service company, admitted in court Thursday to bribing three former Alaska lawmakers, including former Senate President Ben Stevens, the son of US Senator Ted Stevens. Ben Stevens is under multiple criminal investigations for corruption and bribery. 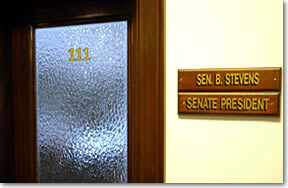 "Although Allen and Veco characterized these payments as being for consulting services (to Ben Stevens), Allen acknowledges that in actuality the payments were in exchange for giving advice, lobbying colleagues, and taking official acts in matters before the legislature," an FBI statement said when Bill Allen was indicted. Stevens has also pocketed over $659,000 from the At-Sea Processors Association (APA) and other fisheries companies to serve as a "consultant" between 2000 and 2005. The APA, the Alaska Fisheries Marketing Board, and his father Senator Ted Stevens are all currently under FBI and IRS investigation. Allen is cooperating in a massive FBI corruption investigation that as of September 13th, 2007, has snagged two of the state's three members of Congress, one of their aides the ex-president of the state Senate, four state legislators, and two VECO executives. Veco's bribes of $243,250 to Stevens between 2002 and 2006 documented in charges against Allen precisely match the amount Stevens reported on his financial disclosures as consulting income to his company, Ben Stevens and Associates. In testimony Thursday, Bill Allen said Stevens made about $3,000 to $4,000 a month from Veco, though he didn't know specifically how much Stevens has made over the years. Federal prosecutor James Goeke asked Allen about his guilty plea, and who he pleaded guilty to bribing. "Pete Kott, Vic Kohring and Ben Stevens."